Home › Uncategorised › How close is too close? 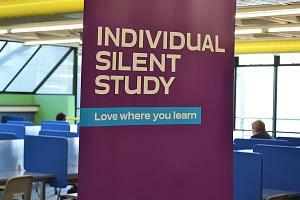 In the past you told us that some of the silent areas of the Library were noisier than they should hav been. That’s why we recently restructured the Individual Silent Study zone, grouping several areas together into the side of the building that is naturally quieter, retraining our staff and increasing the frequency of patrols. You might have noticed the striking new purple banners flanking the entrance to each zone. By replacing shelving with study spaces, we are able to offer more space to study in silence now than ever before, and we have made sure that all the seating in the individual silent zones encourages individual study without talking. We even introduced offer free earplugs for anyone those times when you want to blot out the world completely and work anywhere without risk of interruption – we find they are useful anywhere, not just in the silent zone!